When it comes to building a new business, getting the word out about a new product, or simply keeping your services at the top of mind, you can’t go wrong with a quality promotional ceramic mug. Offering everything from the traditional styled mug through to colour changing and photo mugs, coffee mugs are a great promotional tool for any business. EzyMugs offers a large range of ceramic mugs to businesses, covering everything from a standard promotional mug through to a café range. Branded coffee mugs can help bring business through your door, and the range of durable, long-lasting and well-made coffee mugs from EzyMugs are a great choice. The Barrel Coffee Mug is available in three standard colours – black, cobalt blue and white – and in a large 440ml capacity. With a large logo print space available, these mugs are a great choice for Christmas gifts for any business. The Office Mug comes with its own silicone base making it perfect for the home or office – there’ll be no burnt desks or easily knocked over mugs of coffee with the Office Mug. With a large range of colours, and a great logo print space, these mugs are perfect for promotional giveaways and gifts. For cafes and restaurants looking for a basic yet durable coffee mug to use, or for brands to distribute to the hospitality industry, the Valentia offers a tapered mug that’s stylish and looks good. 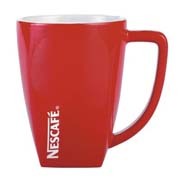 Available in standard colours, these mugs are a great way to promote your café, restaurant or coffee brand. EzyMugs also offers a range of mug gift boxes, giving you options for presenting your mugs as gifts or as promotional merchandise. Branded coffee mugs have long been an established way of getting a business brand in the face of customers and clients, and the range of mugs from EzyMugs ensures you’re getting a durable, long-wearing, stylish and quality promotional mug for your business.